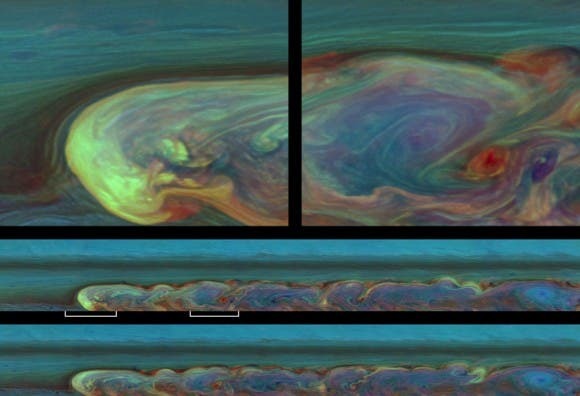 The heat-seeking capabilities of the international Cassini spacecraft and two ground-based telescopes have provided the first look at the aftermath of Saturn’s ‘Great Springtime Storm’. Concealed from the naked eye, a giant oval vortex is persisting long after the visible effects of the storm subsided. As the visible storm erupted in the roiling cloud deck of Saturn’s troposphere, waves of energy rippled hundreds of kilometres upwards, depositing their energy as two vast ‘beacons’ of hot air in the stratosphere. The beacons were expected to cool down and dissipate, but by late April 2011 – by which time bright cloud material had encircled the entire planet – the hot spots had merged to create an enormous vortex that for a brief period exceeded even the size of Jupiter’s famous Great Red Spot. The temperature of the vortex was far higher than expected, some 80ºC warmer than the surrounding atmosphere. At the same time, huge spikes in the amount of gases like ethylene and acetylene were detected. The ground-based observations were made by the Very Large Telescope of the European Southern Observatory in Chile, and NASA’s Infrared Telescope Facility at the summit of Mauna Kea in Hawaii. The vivid cloud structures that wreaked havoc across wide swathes of the mid-northern latitudes of Saturn’s atmosphere captured the imaginations of amateur and professional astronomers alike, from its first appearance in December 2010 through much of 2011. 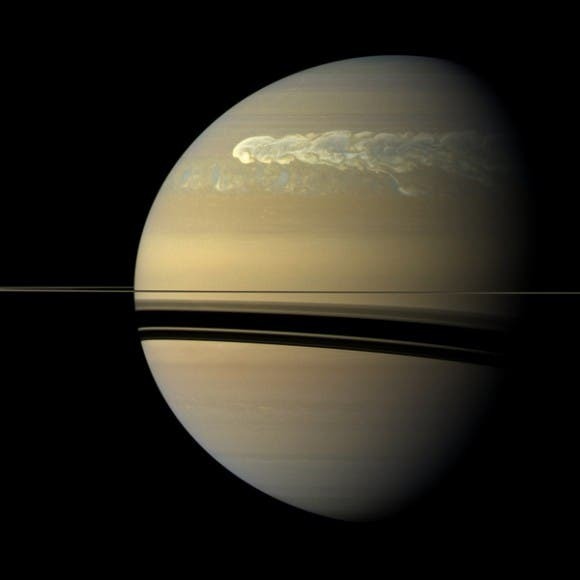 But in new reports that focus on the temperatures, winds and composition of Saturn’s atmosphere, scientists find that the spectacular cloud displays were only part of the story.Much of the associated activity took place beyond the reach of visible-light cameras, and the after-effects are still continuing today. The question now remains as to whether Saturn’s storm-generating energy has been sapped or if there will be a repeat performance. The outburst already caught observers by surprise by arriving during the planet’s northern hemisphere spring, years ahead of the predictably stormy summer season. In the iamge below NASA's Cassini spacecraft captures a composite near-true-color view of the huge storm churning through the atmosphere in Saturn's northern hemisphere.